The Stock Markets are Ripping Up. The Economy is Slowing. What Could Ultimately Be Wrong? You are at:Home»ETF Strategist Channel»The Stock Markets are Ripping Up. What Could Ultimately Be Wrong? The Stock Markets are Ripping Up. What Could Ultimately Be Wrong? Measuring the Chinese Economy. What to Trust? The 2019 recovery of U.S. and international equity markets continues to claw back at the losses from late 2018. Traditionally, stocks have been a leading economic indicator: investors look at both current and future earnings and want those earnings to go up. It makes sense. When shares are bought, the price that an investor is willing to pay for a stock is a reflection of the future cash flows that can be returned to the investor in dividends, stock buybacks and/or a higher stock price. 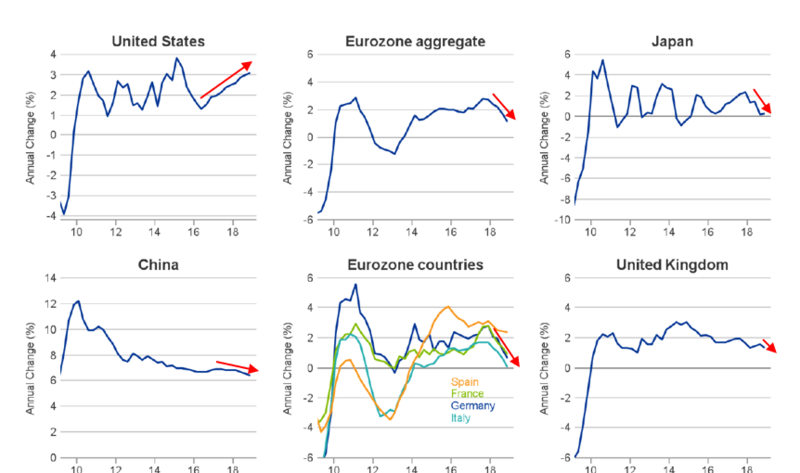 Despite the global stock rebound, by many measures the global economy is slowing. Let’s examine the disconnect. In terms of global GDP, the U.S. is the best house in a bad neighborhood. 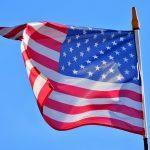 Most of the world is feeling the effects of the trade war which we’ve written about extensively. 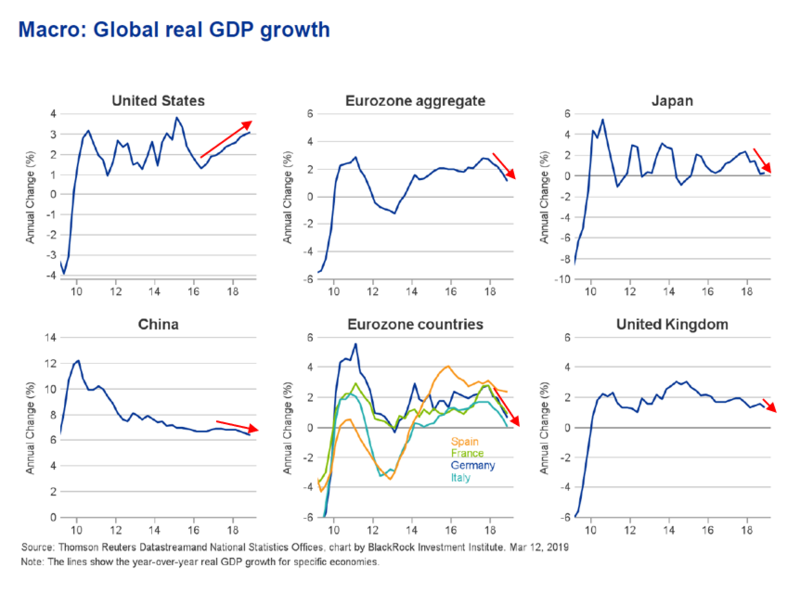 Given that we live in a global, intertwined economy, the U.S. is not on an island and even our GDP growth has been slowing. The Bureau of Economic Analysis tells us that 2Q18 GDP was 4.2%, 3Q18 GDP was 3.4% and 4Q18 GDP was 2.6%-not a favorable trend! But what about the earnings of the companies listed on the U.S. and international bourses? 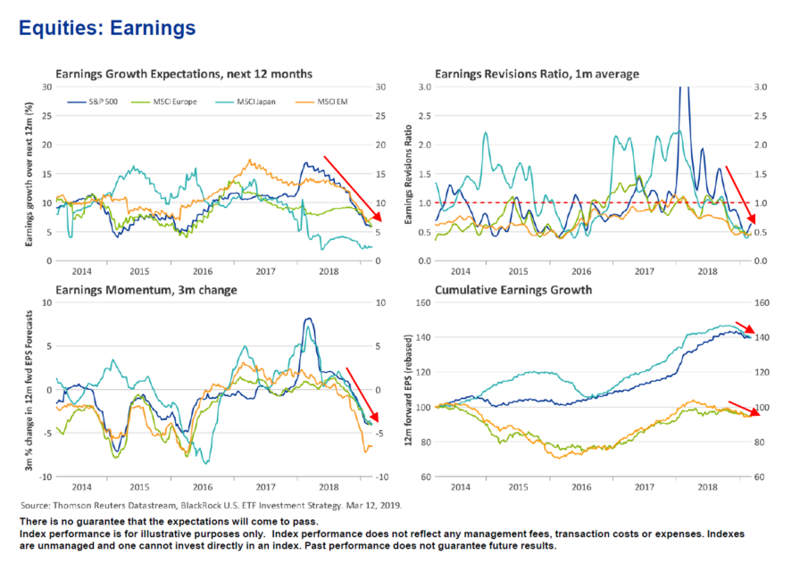 Since the beginning of 2018, U.S. 12-month forward earnings growth expectations have been cut by roughly 2/3rds! On a 3-month basis, 12-month earnings momentum has turned negative for the U.S. and the vast majority of both developed and emerging market equities.